Are you a renter struggling to find a place? Feeling frustrated? Or are you a property manager/owner who would like to be able to manage, monitor, and show your properties without having to manage, monitor, and show your properties? No problem, you just need self-showing technology. 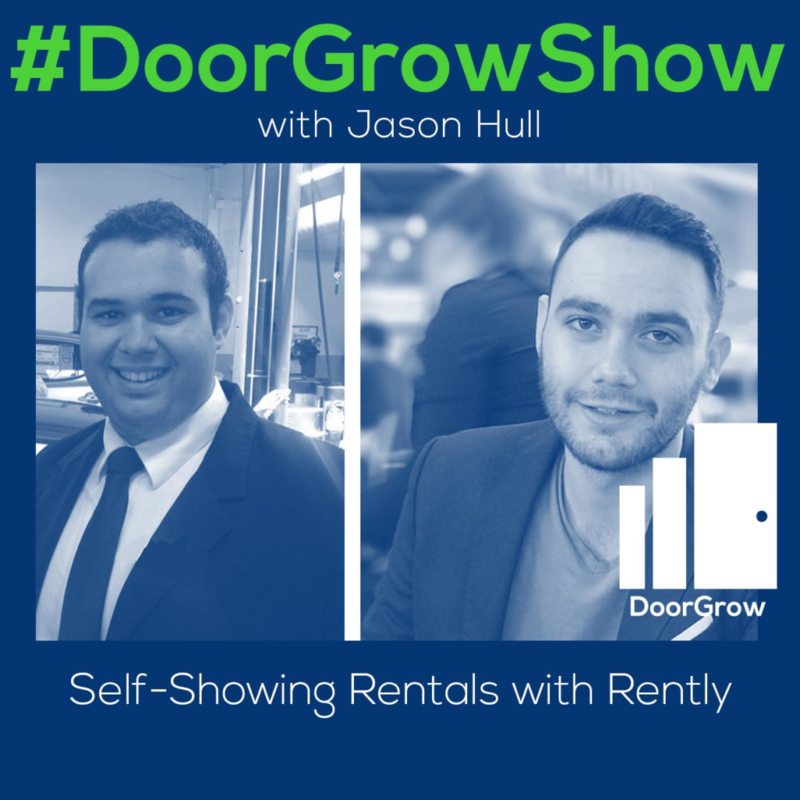 Today, I am talking with Pini Lackner and Edward Gonzales of Rently, which allows prospects to visit rentals themselves when it’s a convenient time for them by using self-showing technology. Rently’s technology helps optimize and systemize the showing process to lower operational costs. [05:18] Statistics show that 70-80% of people looking online for places to rent tend to be window shoppers; can be frustrating and time consuming for managers to reach them. [06:08] Property management involves building/keeping relationships with prospects. [06:48] After self-showings, Rently performs an application follow up to get feedback on a property without having to rely on an agent. [07:23] Some are concerned that there’s too much risk involved; fear factor fades because of Rently’s reputation and self-policing system based on info from prospects. [10:22] Those interested in Rently’s technology have a growth mentality; there’s no better way to grow your business geographically. [11:17] Benefits include lower operational/staffing costs and shorter lease cycle. [12:05] Considering Rently as best way to optimize business operations while lowering expenses and not losing touch with properties. [12:42] Self-showings are its backbone, but Rently is a fully encompassing platform – not just a bunch of lockboxes. [13:50] Rently Keyless addresses the increased prevalent use of smart homes. [18:02] Regaining control restricting access is instant via Rently after a tenant leaves. [18:55] Rently provides homeowner reporting, metrics, and analytics to know what’s going on with properties. [21:07] Initial reluctance to self-showings has eased, so managers who don’t use it now will lose their competitive edge. About 70-80% of people looking online for places to rent are window shoppers. Self-showings create positive pressure to report things. Self-showings are its backbone, but Rently is a platform - not just a lockbox. Jason: And we are live. Welcome DoorGrow Hackers to The DoorGrowShow. If you are a property management entrepreneur that wants to add doors, make a difference, increase revenue, help others, impact lives, and you are interested in growing your business and life, and you are open to doing things a bit differently, then you are a DoorGrow Hacker. DoorGrow Hackers love the opportunities, daily variety, unique challenges, and freedom that property management brings. Many in real estate think you’re crazy for doing it. You think they’re crazy for not because you realize that property management is ultimate high trust gateway to real estate deals, relationships, and residual income. And today, I am hanging out here with Edward and Pini of Rently. Edward, Pini, welcome. Pini: Hey, Jason. Thanks for having us. We appreciate it and look forward to the show. Super excited. Jason: Yeah, excited to have you guys on. It’s been a long time coming. Rently has been part of the property management industry for a while now and you guys are really well-known for this cool […] and self-showings. I’d love to start at the beginning. Maybe if you can give us a little background on how did you guys get into this, how did this business get started, and why don’t you both introduce yourselves and share with everybody what your roles are at the business? Pini: Yeah, absolutely. I’ll start off. I’ll introduce myself and give you guys a little bit of a rundown of the Rently history and how Rently started, then I’ll have my man, Edward over here introduce himself as well. For starters, my name is Pini. My brother, Merrick, actually founded Rently, going eight years ago now. Thank God we’ve been tremendously successful in bringing self-showings to the market. A little content of how this whole thing got started with self-showings and it’s really a great story just to know a little bit about the Rently history. Merrick, he actually studied at UC Berkeley at the northern California and my family, we were born and raised in Los Angeles. I remember even to this day, this is long before we even started, just when we came up with the idea of self-showings, he called up my mom, so frustrated that he drove all the way from Los Angeles to UC Berkeley to look for places to rent, was only able to check out two units, and was forced into a lease that he was really completely not even interested in finding to begin with. After the whole concept of Rently really opened up from a renter’s perspective who’s struggling to find a place to rent, and then the benefits from managers and investors really kind of came into play and became obvious after that. The time saving, the energy saving, and being able to lease the property faster. But really, that’s a little bit of the company history is a college kid trying to find a place to rent, wasn’t able to, who’s really frustrated about the experience, and then just came up with this brilliant idea. Jason: So, born out of the pain of trying rent a place and anybody who’s ever rented has experienced this pain. That’s probably just about everybody’s probably rented at one point or another in their life before they got into a home, or they choose to rent. The challenge is, you have to figure out how to fit into other people’s schedules and a lot of times, these companies aren’t doing it during the hours that you want to do it, which is after hours. I can totally resonate with this frustration. I remember even having to go to some rental companies to pick up a key. They made us go pick up the key to go back out to the place to see the place. Then there were instances where the key didn’t even work and I was losing it. I’ve been there. I think people experienced this frustration. Why don’t we let Edward introduce himself here, too? Edward: I’ve been with company for almost about three years now and worked primarily into sales, going to trade shows, treating you all like the gits that you are, and making sure that the revenue keeps on going from that kind of end, but work pretty closely with Pini. What we’re doing is amazing and we’re so excited to talk to you about it. Jason: Alright, welcome. This is kind of how the idea was sparked and why don’t you explain a little bit to those that maybe aren’t familiar with Rently, what is it? Pini: […] process of what is a self-showing, what does it actually mean, then we’ll touch on it like […] of self-showing, and then obviously, the looming question that everybody’s going to have, which is the security of self-showing and allowing people to review properties at their own convenience. For starters, what is a self-showing? Here right in front of us are multiple lock options that we provide with just a standard lock box or a keyless lock that goes on the front door. The idea is that the process begin with us actually time giving help with your actual marketing, where you’re getting increase in you’re daily clicks on your properties online. Statistics show that about 70%-80% of the people looking for places to rent online tend to be window shoppers. For you as the managers getting back in touch with those leads can be very frustrating and time-consuming. Essentially, what we do is, we step in and right when the person is looking at your listing online, we have relationships that allow us to give that prospect instructions on how to get registered with their ID, credit card, we verify both of those pieces of information, and then they’re given instructions to receive a one-time access code which is electronic and changes after the dealing, and then you guys could set the hours that you’re comfortable with letting people in. One of the nice things is that through the rent through self-showing mechanism, there’s always real-time checking alerts so we know that in property management, keeping relationships, building relationships with prospects is a big deal. That’s why we have the check and features, call riders engage them, and essentially get the same work done as if you have a human being there without having the send a human being out there. You’re going to see by utilizing and looking into this, it’s become a complete industry norm, is that 70% of your showings are coming during hours that you’re normally not available. As Jason mentioned before, after hours and weekends is such a big market to tap into and that’s when the hardest people are trying to showings as well. Along with self-showings, right after people leave a property, we like to help take it to the next step with whatever online application you guys are using. We’ll do follow-up, where we’ll basically ask the people to rate the property, leave comments, so you’re looking almost literally from a full A-Z cycle of getting the property shown, getting feedback, and having applications to allow without having to rely on an agent or somebody in the office every single step of the way, since it really big-time efficiency load out there. Jason: So it really helps to optimize and systemize the process to lower their operational cost towards doing this manually. How do you guys deal with the issue for those that are dinosaurs and concerned and you probably run into this a lot that people are like, “This just wouldn’t work in my market. There’s just too much risk. It’s too crazy to just let people in and not have somebody there with a machine gun watching over them, making sure they don’t do anything.” How do you address this fear that people have of doing self-showings? Pini: Actually, it’s funny because I’ve been working at Rently a little bit over five years or six years – Rently started almost eight years ago. But I do remember when I started making phone calls five years ago to property managers who tried to introduce this concept of self-showings, the security fear was so great, and at that time self-showings wasn’t really such an established concept so I think the fear was really legitimate. But I think Rently has proven. We got over eight million check-ins on our system. I think our reputation as a company in the years that we’ve been doing this has proven that self-showing is actually a very safe concept when you get that credit card on […]. Credit card is a very, very big fundamental factor in ensuring that people are going to treat the property with respect and it actually creates this self-policing system. You go into a hotel room and something seems off, you’re going to call the front desk. If you go in a Rently property and your credit card is having problems, something seems off, you’re going to report that to either the manager or to Rently and you will help with the investigation. But again, as a company, eight million check-ins, it really doesn’t come up because that security protocol that we take. All the personal information, checking ons, and […] as well. That’s interesting. I didn’t think of that. I believe in general, people are good and it really prevents people from being connected to this property in a negative way or trying to do something in a negative way to get into the place. Basically, we have security down pat that any criminals that wanting to go in are just going to break in through the back door. They’re not going to leave their credit card or ID or anything like that. It’s just common sense so I don’t think so. Jason: They’re not going to worry about lock boxes and stuff like that. They’re going to just get in anyway. Edward: They want them, yeah. Pini: And I think another point to touch upon, Jason, is one of the things I love is the name of this podcast that you have is called DoorGrow. Being mindful of that, people listen to this kind of a podcast and are interested in this kind of stuff, also have growth mentalities. I don’t think there’s any better way to grow your property management business, portfolio-wise and geographically, it’s something like Rently because it creates this unlimited grass that you can now take properties in other regions, in areas that you would never even consider before because you’re not relying on a human being every step of the way. I think expanding your business, taking on doors that are further away by using self-showing as a huge benefit or putting up those after hours in weekends, what you’re doing is you’re making your owners happy because your properties are coming off the market way faster than your competitors because you’re offering their needs. Jason: Yeah, it enables expansion. It also lowers their operational cost and their staffing cost in order to manage as many rentals. It shortens the cycle to get things leased out, which is going to be pleasing to the owners, lower their cost, and is a competitive advantage in selling your property management company. I love all of this stuff. What else do people typically want to know about how this process works? Pini: I have to say, the first thing is obviously like I kind of touched on before is I think in property management, there’s actually an article about how technology and real estate are finally at a point where they’re really, really reaching a collision for the positive in respect that, you’re going to see a lot more technology implementation in property management and real estate in the next few years. I think when people are looking at Rently, it’s “What’s the best way to optimize my business operations while lowering my expenses but still not losing touch of my properties and losing touch of my business?” We’re very, very mindful of that and the way I look at this is if you have a scattered-out portfolio, the properties that are just further away—obviously we’re dealing with vacant units here—you’re not going to put a Rently box on an unoccupied property with a bunch of furniture and tell people to self-tour. We offer online pre-screening schedule […] don’t know that. Rently is a fully encompassing platform, a lot more than just lock boxes. Also the self-showing is the base of what story Rently and what Rently pioneered, and it’s definitely the backbone of Rently, but as we grow as a company, we want to be more flexible to managers as well. We developed automated online pre-screening and scheduling for appointment booking software as well. That includes confirmations. Think about it like a doctor […] you go, book an appointments to the doctor, and then the office concerns but it’s for property management and is basically the way […] will sync up your calendar availability, letting me pre-screen and then schedule online as well. I think when you combine the self-showing lock boxes on vacant properties that are unfurnished, and then you’re going to be looking at using something like the scheduling for your occupied properties, it’s an all-encompassing solution, that the way I like to say, that allows you to manage, monitor, and show your properties without having to manage […] to show your properties. I think that’s really the beautiful part about it there. Jason: But you guys also manage another thing that you’re doing, which is Rently Keyless, right? Pini: Yeah. I was about to kind of go […] things and where Rently sees the […] going. We started doing something called Rently Keyless. Makes the keyless technology but it’s also full-on smart home solutions as well. I think in the multi family space, in the vacation rental space, smart home technology is very, very prevalent. It’s taking off and we’ve been able to make a big […]. Keyless solutions include various different packages. A lot to start essentially and then what happens is we connect that with a hub that then creates an interconnected property where you could remotely control AC, there’s a lot where you can tell that remotely and for how long. You can select durational codes. What we’re seeing there is that on vacation rental side, it’s really great because then it integrates with booking software and it allows you to really put advantage of a short-term property that’s constantly having turnover and you want to be able to manage that remotely. Keyless is an added amenity on the multi family side and smart homes just quickly, in the next two years, is going to be […]. We view that as the company trajectory of things that we have in the pipeline, is going a big focus on keyless technology in the multi family space and obviously had an available for the single family property managers when the time is ready. Keyless is more I think focused on the multi family short-term vacation on the side. Single family side will get there, but now we introduce this is actually a lot that we manufactured ourselves. Like you said, it’s Rently Blue and it’s really a keyless lock for property managers that makes sense to kind of get your feet into the smart home world without having to fully rely on cell connectivity or wifi connectivity. It’s actually Bluetooth-powered and by doing so we’re able to actually keep your monthly cost very low. I’ll explain. Basically, while the unit’s baking, you can install this lock on the door, a standard keyless lock that actually replaces the deadbolt. While it’s baking, we’ll do all the marketing stuff with allowing renters to register with their IDs, credit cards, personal information. They’re actually a little more secure because they’re not getting access to a key lock, a lock box, but they’re actually getting a code that’s going to then unlock the door and they’re getting in, and then at that point, what basically happens is it works the same as everything I just describe with Rently after they view the property. We’ll be showing follow-up, surveys, and feedback. But here’s the difference is that the Rently Blue is a lock that if you guys want to basically available for purchase, it’s a one-time purchase fee of $149 and it comes with a one-year warranty. Then, while it’s activated on a vacancy, you let us know and the charge is basically the regular Rently fee which is just $30 a month to use all the marketing and self-showing, but here’s the catch. With the Rently Blue, once a renter moves in, we developed these beautiful apps that they could download on their phone and they could start controlling this lock on their phones. They could set-up family codes, housekeeper code that comes in maybe twice a week. If you have a maintenance person, as a manager that needs to get in, they could in there using codes. […] is keyless environment not belong to smart keyless environment during the time of occupancy, which basically creates added value and for renters, you could charge them more by adding this as an amenity, maybe adding $10 a month on top of your normal rent rates and now you’re catching additional revenue. Then if you’re thinking granually, you get one of these things at your doors and you never have to […] your property again. So, I think there’s a big opportunity there. Jason: Yeah, really cool. Is it battery-powered? Is it battery that needs to be changed? Pini: Yeah. Right at the back of a Rently Blue lock, it just runs off standard AA batteries. They’re easy to change out. Once the lock hits 30%, it starts sending out notifications to go ahead and change the battery. But again, there’s no actual physical hub required in the property, there’s no cell required or wifi, it’s all Bluetooth-enabled. There’s two options. When somebody moves in, after they move in and one of the units has one of these Blue locks on the property, they could turn their phone actually into a Bluetooth key, which basically like their cars nowadays. If you walk up to your car, your car will unlock for you. They can do that. They can have their phones, their family phones setup on the Bluetooth keys, their friends visiting town, they can get their friends set up on the Bluetooth key. The alternative is actually just be able to actually set up customized codes that they will be able to enter so they don’t have their phone on them or their phone’s dead, they can use their personalized code to get in. But again, I think it’s where the industry is headed. It’s keyless and I think if we can fast forward 5-10 years from now, for sure I don’t think keys are going to exist there. Being that the case, in our opinion, we want to be the ones introducing this technology to the market, hence the first keyless solution in the world that integrates with the self-showing technology, safe, secure, and efficient the way around. Jason: Very cool. After the tenant then leaves or they’re evicted or something like this happens, how difficult is it to regain control over the system or over that door lock? Pini: It’s instant that’s what’s great about it. You would login to Rently, you would restrict the resident’s access to the property. Essentially their code’s erased. Their phone numbers that was associated with that lock are then removed from the memory, essentially, and then what you can do is get that property right and get back on the market and then right in Rently, you just click market property and then we throw that unit right back in the self-showing mode. It’s a way that you don’t have to move lock boxes around, need to lock on the door, and then you pick and choose how to use the system. Current residents or self-showing during the time of eight. Jason: Love it. Cool. What else are you guys up to? Pini: I think another thing that we help with is on a data and analytic side, homeowner reporting, and things like that, you guys want to be able to, from a bird’s eye view, have metrics on exactly what’s going on with your properties and I think something that we’re very excited about the amount of unique traffic in organic leads provides as a service for property managers. A lot of managers even pay for advertising to sites like rentals.com and different “premier” listing sites to get additional exposure. Because Rently’s been doing self-showings for the time that we have, we built a massive network of probably trading investors down to the mom and pop property management companies that are actually listed on rently.com and the only way that you do get listed on rently.com is with using our service. We’ve seen how organic traffic rently.com just skyrocket in the past few years because self-showing has become such a trend, people who use Rently in the past—somebody who used Rently two years ago do a self-showing—is not compelled to now go look for a place on Trulia or Zillow because they use Rently, so where they going to go? They’re going to go and search on rently.com. I think the benefit of actually looking at Rently as a unique resource that you will be able to tap into and get a ton of organic leads that you would not had access to otherwise, I think is another big benefit. When you do cross-market analysis, the nationwide average to lease properties on a monthly service is about 7-10 days. Depending on the market, you’re looking at averages in between 21 and 30 days. But I think it’s obvious when you really think about it and there was reluctance to the self-showing concept when I first starting it, selling it about six years ago. But I think now, the managers that don’t jump on board the self-showings will inevitably fall behind the competition. If you just think about it from a numbers perspective, if I’m a physical human being and I’m an agent for Edward Property Management over here, and I’m the best agent in the world, there’s only so much I can physically get done in a day. If I’m showing the property to one person, if I’m dealing with an owner, I can’t be 3-4 places at once. I think looking at Rently from a perspective of being able to expand your capabilities to maximize your human resources, one person can literally get the work done of four people, it’s a no-brainer. One of the great things about our service is we don’t believe in contracts, we don’t believe in anything like that. We are a strictly month-to-month program. We’re so confident in being able to execute that the managers that tried us out, and that’s what we keep on month-to-month and that’s why we have the reputation that we had is one of those things. Once you try Rently, you cannot go back to the old way of showing properties. You’ll see crossmark analysis of your properties coming off the market and a way more expedite manner than they have in the past because again, you’re using technology not as a replacement but as an assistant to your operations, to help you get a lot more done. Edward: And then just as from the renter’s perspective, it becomes just amazing. They tell their friends, they tell everybody – they don’t have to wait on an agent’s schedule or after [5:00] PM or maybe it’s Labor day holiday, holidays are coming up. It’s one of those things where it’s just going to give you so much more ammunition when you approach the market basically. Jason: All right. Creates some positive word-of-mouth in the market regarding your company. Sounds like there’s lots of benefits. How would you recommend people get in touch with Rently? Pini: You go to rently.com. You click on For Managers, get the full scope of the services that we have to offer. My phone number is 323-375-5773. We’re the kind of company that is very easily reachable. Because we’re month-to-month we have a great support department that trains you guys up, nurtures you, and holds your hand, to make sure that you see success because your success is our success. If you’re not successful, we know that we won’t be successful. Your feedback and really we want to be there for you on the frontline to see this work. Again, 323-375-5773. My email is pini@rently.com. Obviously, you’ll find our contact just on rently.com. You could shoot email to our support team. We’re very easy to find and I think we’re a very easy company to work with. Even because you’re at the NARPM conference that they just did down in Coronado, it’s amazing to see the difference and the perception of property managers when they hear about self-showings today versus what it was seven years ago. I mean, there was a core concept– it’s incredible, it really is. I’m glad that Rently could say they’re behind self-showings. We invented it, we have the most secure and efficient process, and I think from a features support and rising perspective, it could really get you guys love what we have to offer. Jason: Yeah. The self-showing concept seem like a no-brainer to me. I grew up with a real estate mom and I was always amazed, like real estate agents can just walk into any of these houses, like they can just move this thing to get in. Why can’t everybody do this? It seems like the inevitable thing to happen. Well, I appreciate you guys coming on the show and sharing with us some of the innovations, some of the things you guys are working on and bring to the market. Excited to see what kind of things you guys do in the future. Any parting words for the DoorGrow Show listeners? Pini: Yeah. We appreciate you having us obviously, Jason, on the show more frequently as we roll our new, exciting things. We’ll set something up for the new year. We’ve got some exciting things to announce there going to 2019. But again, if anybody’s any questions, any comments, anything that needs Rently, feel free to reach out. We’d love to hear from you guys and we’re really are going to revolutionize this industry. Mark our words, you will love it. Jason: Awesome. I love it. All right. Thanks so much guys for coming on the DoorGrow Show. It will be exciting to see what kind of new things that come out within the future. If this is your first time watching or listening to the DoorGrow Show, make sure you subscribe to our show in iTunes and listen to our other podcast episodes. There are lot of really great entrepreneurs, different vendors, tools and resources, lots of mindset stuff has been shared. By the time this is released, we’ll probably be at our conference at DoorGrowLive but if you’re listening to this live, make sure you get some tickets to DoorGrowLive. It’s going to be in November 14th-16th and it is going to be an awesome conference. Make sure to be there. Everybody, if you are a DoorGrow Hacker, then you got to be with the other DoorGrow Hackers. Get inside our Facebook group, go to doorgrowclub.com and that will get you right to our Facebook group. You have to apply to get in there. We want to make sure you are actually a property management entrepreneur and a DoorGrow Hacker. If so, you will be welcome into that group. It’s an awesome resource and community of like-minded property management individuals and helping us achieve our vision of transforming this industry. I’m Jason Hull and appreciate you listening to the DoorGrow Show. Bye, everyone.